A few days after the opening of the season, we now have our first round up of the 2015-2016 PBA Philippine Cup! Yahoo! 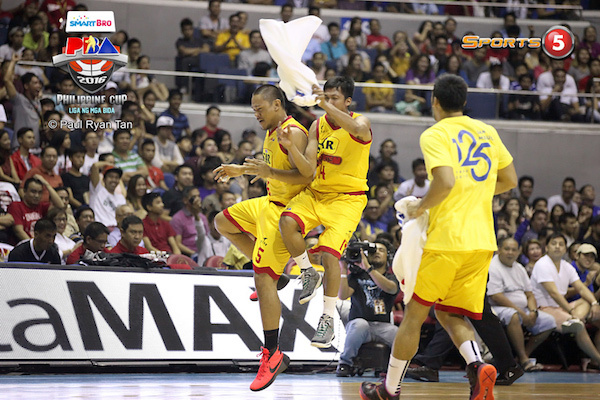 Oh, and did you see that STRANGELY ENTERTAINING jumpshot by Manny Pacquiao! Kudos to the future senator (face it, he will win)! Kudos, too, to the Painters for beating Mahindra and for the Star Hotshots defeating the fancied Gin Kings in the season’s first Manila Clasico! The Rain or Shine Elasto Painters made it two games in a row to open their SMART BRO PBA Philippine Cup campaign after a 108-94 victory over the Mahindra Enforcers on Sunday at the SMART-Araneta Coliseum. Rain or Shine had another balanced effort with five different players scoring in double figures for the deep Elasto Painters. JR Quinahan and rookie Maverick Ahanmisi led the way with 14 points apiece while Jericho Cruz and Jeff Chan each added 12. Beau Belga also contributed with 11 points and eight rebounds in the game. 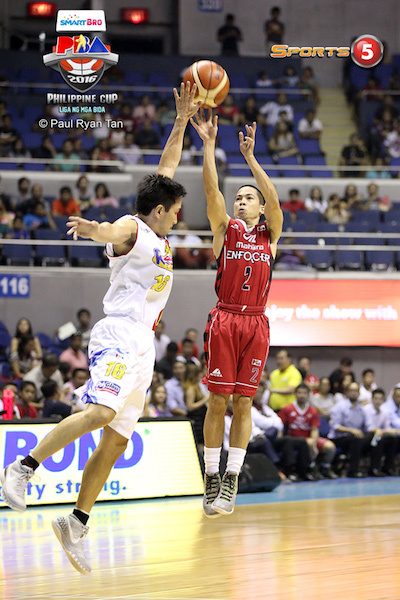 Three other Elasto Painters scored eight or more points. Mahindra stuck close early in the contest but Rain or Shine stamped its class in the third quarter. The Elasto Painters outscored the Enforcers, 31-20, in the period, pushing what was a four-point halftime lead up to 15 points. They led by as much as 22 points in the fourth quarter. NOW HERE IS MANNY PACQUIAO'S FIRST PBA FIELD GOAL! Maverick Ahanmisi (ROS) - 14pts, 4rebs, 2asts, 2blks, 1 triple, 5/7 FGs. LA Revilla (MAH) - 14pts, 5rebs, 7asts, 4stls, 1 triple, 5/9 FGs. 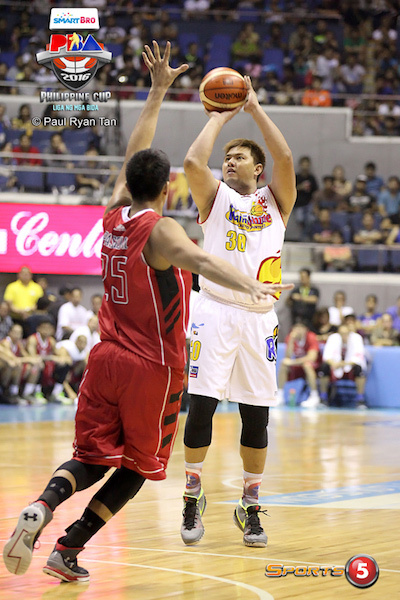 Beau Belga shoots over Kyle Pascual. LA Revilla had a good outing for Mahindra. 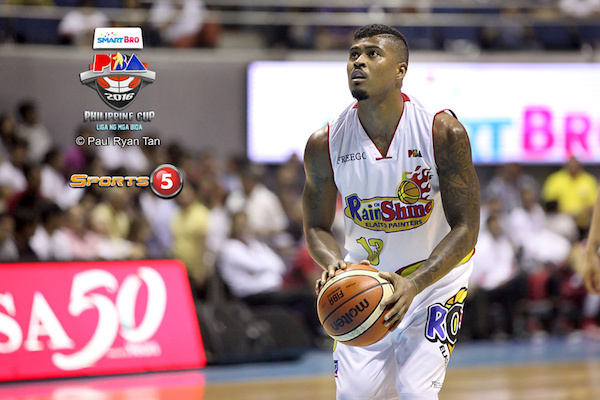 Maverick Ahanmisi finally had a good outing for ROS. Barangay Ginebra made a gutsy attempt at a comeback late in the game but Star’s lead proved too large to overcome as the Hotshots escaped, 86-78, to win the SMART BRO PBA Philippine Cup’s Manila Clasico match on Sunday at the SMART-Araneta Coliseum. 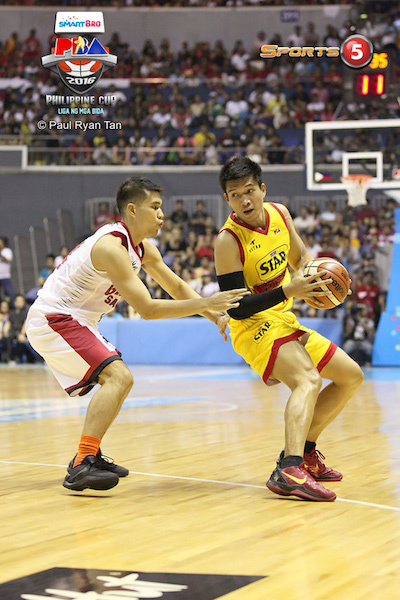 James Yap topscored for Star with 19 points – 16 of those in the first half where they built their largest leads. Mark Barroca and Peter June Simon provided plenty of punch from the backcourt, each adding 12 markers. Rookie Norbert Torres made all three of his shots to finish with eight points while Gilas Pilipinas stalwart Marc Pingris had just six points but complemented it with 13 rebounds and six assists. Star led by as much as 31 points in the first half but Ginebra made a blistering counter-attack in the fourth quarter, where they held the Hotshots scoreless for the last 4:11 of the game. The Kings were able to chop a 21-point deficit down to single digits but there was just not enough time to complete their fight-back. With the win, Hotshots coach Jason Webb came away with his first victory in the PBA and it came at the expense of his mentor, Tim Cone. Cone got great efforts from his twin towers – Greg Slaughter and Japeth Aguilar – but got very little from the rest of his regulars. Slaughter had 28 points, 16 rebounds and four assists while Aguilar nearly matched those numbers, scoring 26 points as well as equaling Slaughter’s rebounding and assist totals. Rookie Scottie Thompson played some quality minutes for Ginebra in the fourth quarter, finishing with five points and a team-high six assists despite playing just under 17 minutes. Marc Pingris (STA) - 6pts, 13rebs, 6asts, 1stl, 1blk. Greg Slaughter (GIN) - 28pts, 16rebs, 4asts, 1blk, 12/18 FGs. 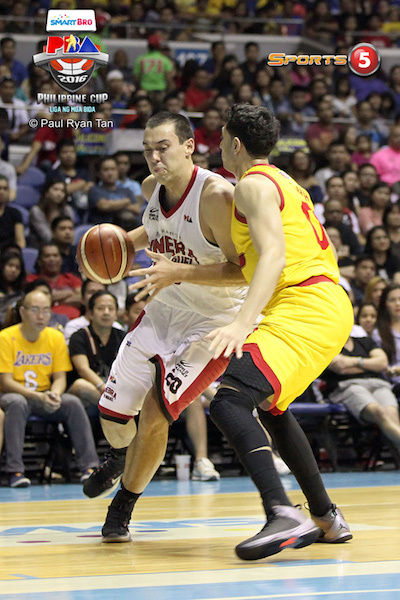 Greg Slaughter unloaded a monster of a game for the Kings. James Yap and the Hotshots furstrated their formr coach. 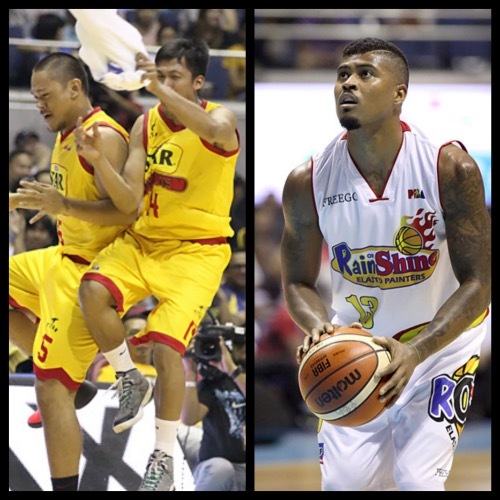 Star rebounded from an opening loss to Rain or Shine. Images are by Paul Ryan Tan/Sports5.